Life goes on as usual in the Casbah. Old women clad in the white haik climb up the narrow impasses with their grocery bags. Young boys play football between the crumbling houses. A man sipping coffee sits on the doorstep of the centuries-old hammam, a cane in his hand. The laundry float in the wind on the rooftops where the girls hang out at sunset, staring at the dark blue sea below, watching the ships heading slowly to the harbour. But on Fridays everyone comes down and join the crowds pouring in from Bab el-Oued, Ben Aknoun, El-Harrach, from all the districts of the town. Soccer fans with their clubs’ banners. Families with little children in tow. Journalists and social activists. Unemployed workers and students. Lawyers and peddlers. Shop keepers and taxi drivers. The whole city is on the move. Thousands of stunned policemen and plain-clothes officers observe the human tide clogging the squares, blocking the avenues, swarming the buildings. The mood is joyful. The people are angry but feel released. “We don’t have fear anymore!” shouts the crowd. “The pouvoir must go!” “We have enough!” At least for now, the street has the upper hand. In violation of the constitution president Abdelaziz Bouteflika, 82 years old, confined to a wheelchair and incapable to speak, has postponed the elections, renounced to run for a fifth mandate and called for an “inclusive national conference” to solve the crisis. “We don’t need cosmetic reforms!” retort the protesters. The aging mujahid who fought the liberation war against the French colonial rule has earned some credit in the past: he has steered the country out of the bloody civil war of the ’90 and has invested part of the oil bonanza in badly needed housing projects. Now, after 20 years in power, his time has come. Nobody trusts the shadowy cabala of generals, relatives and businessmen surrounding the rais. The army seems to tilt in favour of the street, although it’s too early to foresee the outcome. 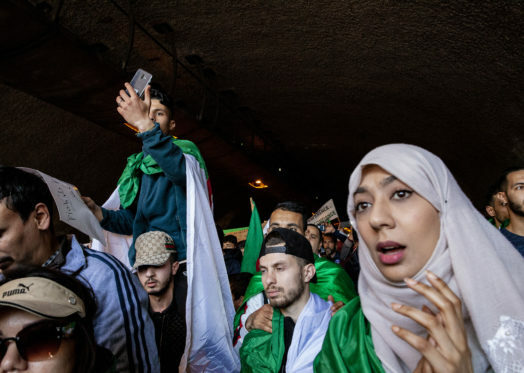 Algerians want a sweeping change: they deserve a more open, democratic government. But the pouvoir won’t certainly give up without a fight.